Time is a funny thing. As humans, there are times when we feel like we have all the time in the world and there are other times when is seems as if there are just not enough hours in the day. As actors, every year that goes by, there are roles that we will never be able to play again. (i.e. 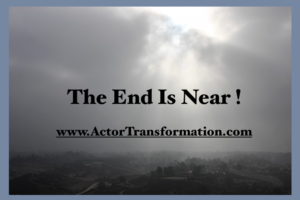 you don’t see too many actors in their 70’s playing Romeo or Juliet) However, On the flip sides, there are also new exciting (and sometimes even better) roles that may come into your career that you never would have been able to play 5,10,or 20 years ago. What IF it really WAS all about to be over? Did you do what you wanted to do in your career? Did you give it your all? More importantly… were you the person you wanted to be? If the end of the world is right around the corner, it seems like everyone would want to make the most of the little time we have on this planet. Right? … Maybe. But I have coached and talked about this over and over again: Many actors rather live in the safety bubble of fear than to step out and venture into the unknown and really take control over their careers. But what if you only had a month or week or day left with your loved ones? What would you do? And on the same but less dire note… what if you only had 30 days to make one of your career goals happen? What if you HAD to accomplish one of your major career goals in the next 7 days or there would be disastrous repercussions ? … You would find a way! Yet this is a career where most actors are unemployed at any given moment. We are our own bosses 99% of the time even when we are successful so if we don’t hit our deadlines, there usually aren’t very scary consequences. Therefore most goals are pretty weak. They have no true motivation behind them and are not even clear to begin with in the first place. Giving yourself deadlines that you MUST complete can be a great tool to use in your career to make things happen. And make them happen quickly. Pick a goal that is reasonable for where you currently are in your career, yet would usually take you a lot longer if you just let it happen “naturally” in its own time. Make sure that it is something that can make a big difference; that you are passionate about and that is within YOUR control. ~ Need new headshots? If this has been a project on your “To Do” list for 3 or more months, then make a phone call right now for an appointment for next weekend. Once something is on your calendar, it has a way of being real. ~ Need credits? Then take the first step and write yourself something today for you to star in. Does not have to be huge, a minute scene might be a good place to start. I often hear that people don’t want to put too much pressure on themselves. But these are often the same people who live rather small lives and therefore… small careers. Can you imagine Meryl Streep saying no to the role of a lifetime because there is a lot of pressure at the Oscars? But keep in mind that if you ever get the career of your dreams that there will be tons and tons of work, pressure and yes… deadlines… So might as well start working those deadline muscles now… You are going to need them!! !